The Waynesboro Police Department arrested a city woman for assaulting her 17-year-old daughter with an aluminum bat earlier today. 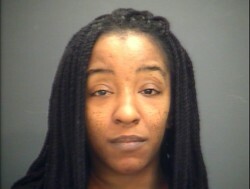 Officers charged Yolanda Denise Walker, 34 years old, with one felony count of Malicious Wounding. At approximately 10:15 a.m, officers responded to an apartment in the 900 block of Shenandoah Avenue for a call of a physical fight involving three women; one of them armed with a bat. When they arrived, officers found the juvenile victim outside the apartment suffering from a large contusion to her head from being struck by her mother. She claimed she had been struck several other times on her body as well. The Waynesboro First Aid Crew transported the victim to Augusta Health Emergency Department. The other woman present, described as another adult family member, had been struck but did not require medical attention. Walker is being held without bond at Middle River Regional Jail.